The different steps of macrosurgical and microsurgical neurolysis procedures are described. 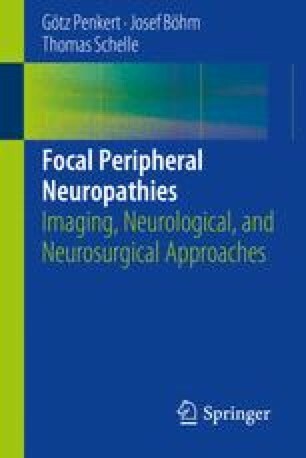 It has to be argued that focal nerve entrapment almost never needs microsurgical treatment. Nevertheless, the different micro-steps, longitudinal incision of the epineurium, removal of circularly compressing fibrotic epineurium, and, finally, interfascicular neurolysis, are described. As focal entrapments mostly consist of a grade I lesion with regard to Sunderland’s classification, and sometimes a mixture of grade I and II lesions, it can be argued that these microsurgical steps are unnecessary. Nerve trunk release has therefore mostly to remain within the paraneurium. Nevertheless, the physician may seldom be confronted with a progressed intraneural fibrosis such as sometimes in cases of chronic ulnar neuropathy. It is pointed out that the surgeon must still decide how far he will enter between nerve fascicles. The answer to whether a bloodless operating field really improves the issue of nerve decompression is a personal opinion. Particularly, one’s own impression may be that a tourniquet could induce severe and painful sympathetic reactions.